A reliable source for Steel Mezzanines information and a resource for accessing leading Steel Mezzanines and suppliers. Steel mezzanines are raised platforms that create extra space for a variety of applications in many industrial and commercial settings. Building a mezzanine in an existing factory or warehouse building is like adding a second floor without incurring the cost of construction materials, labor, building permits, land use permits, taxes and other expenses. Industrial companies that reach the capacity of their facilities must find a way to allow for the continued growth of their operations, and mezzanine construction is one of the most efficient means of space expansion available to industry. Steel mezzanines are among the sturdiest available mezzanine systems. 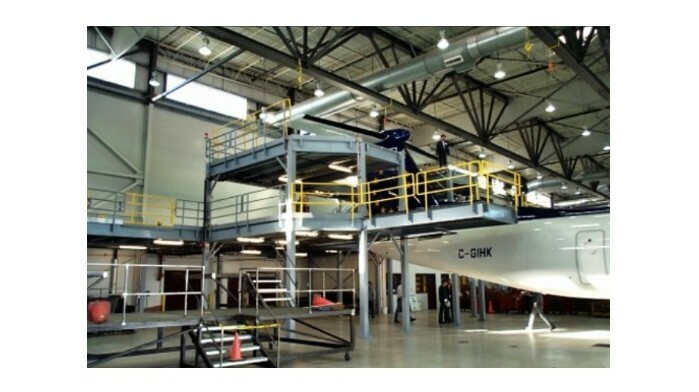 While mezzanines effectively double the capacity of the areas in which they are installed, companies that plan to add mezzanine expansions (or that plan to build new buildings with integral, structural mezzanines) must carefully choose the mezzanine’s design and materials based on its planned application. Steel Mezzanines Steel mezzanines are raised platforms that create extra space for a variety of applications in many industrial and commercial settings. Building a mezzanine in an existing factory or warehouse building is like adding a second floor without incurring the cost of construction materials, labor, building permits, land use permits, taxes and other expenses. Steel mezzanines can be made from solid, grated or perforated platforms. The platforms are supported by beams and columns that support the structure and minimize impedance to movement below. There are three varieties of steel used in mezzanine platform construction: cold-rolled steel, structural steel and stainless steel. Cold-rolled steel mezzanine platforms are lighter than structural steel platforms, though this does not cause any significant reduction in its strength or load-bearing capacity. Cold-rolled steel can also have a smoother finish than structural steel, which makes it suitable for highly visible applications. Structural steel platforms can be the most cost-effective types of mezzanine floors, though they are heavier than other flooring types. Structural steel mezzanines use I-beams, joints and tubular columns for support. Stainless steel mezzanine platforms are the most expensive, but are highly corrosion-resistant; they are most often used by food processing operations. Each construction material features benefits and drawbacks, each of which must be considered carefully in advance of installation.